The Alpina Cabinet is a striking example of contemporary design, with unique details that complement the smooth silhouette. The piece is part of the Alpina Collection, which includes a selection of storage units and tables for the home. The Alpina is built from natural mango wood, a sustainable source of wood that is known for its strength and beautiful appearance. The geometric inlay design completes the look perfectly. The contemporary influence is evident in the angled legs of the Alpina, whose brass colour perfectly complements the natural mango wood. 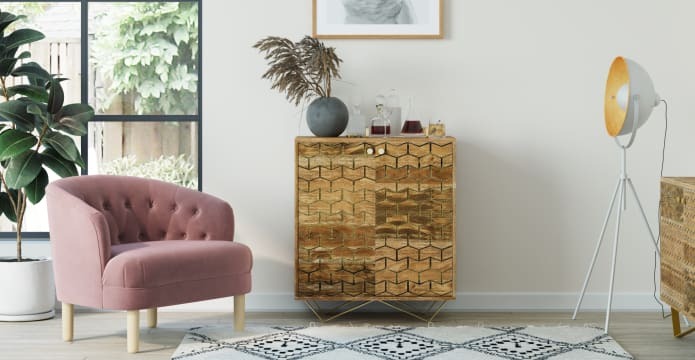 Discover storage units in every colour and style from Brosa. Offering a spacious amount of storage, the Alpina is a stylish way to instantly de-clutter your home. With drawers and shelves in different sizes, you can stowaway whatever you need! 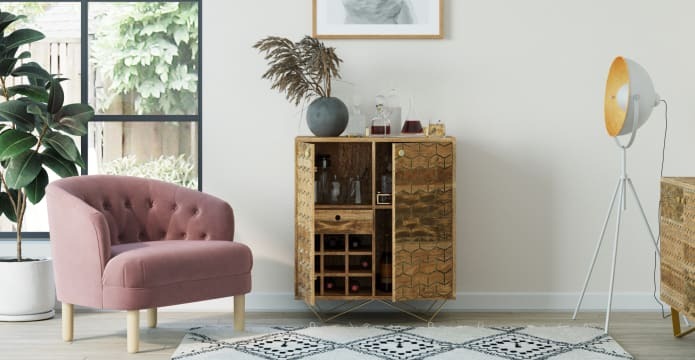 We recommend using the piece as a bar cabinet, with perfectly sized shelves to stash wine bottles. Great item and fast delivery. High quality product.